Compass Municipal Advisors, LLC provides financial consulting to cities, counties and other governmental entities throughout the Commonwealth. We recently completed work with LaRue Fiscal Court to refinance the County’s Jail Bonds, which resulted in a lower interest rate and savings to the County of over $72,000. I took it upon myself to take the advice of our current Judge Executive, Tommy Turner, and research certain information pertaining to LaRue County. My research included, but was not limited to: Debt, Growth, and Economics. I began on a site referenced by Mr. Turner on a social media post. The site contained information about Local Government Debt. I did not limit my search. On Saturday March 3, LaRue County Choir members participated in the fundraiser “Trash for Cash Program”. The choir students were very excited to participate in such a positive, rewarding fundraiser that is able to enhance our community but also gives them more bonding time. Several students and parent representatives of the LaRue County High School Choir came together that morning. They were divided into four large teams and were able to pick up ten miles of trash in their community to help our current choral program. 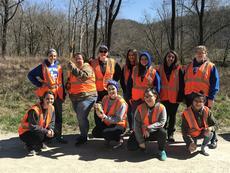 On the afternoon of Good Friday Elizabethtown Community and Technical College Radiography Club members spent their afternoon picking up trash in LaRue County. They were participating in the Trash for Cash program. Seventeen members and one advisor spent hours picking up trash along county backroads. On March 25, several supporters of LaRue County Distinguished Young Woman Program participated in the LaRue County Trash for Cash program. Community involvement and leadership are two components of the DYW program. We appreciate our supporters taking a few hours on a Sunday afternoon to come out and use this wonderful opportunity to make our community a better place to live. Most of the litter we collected were paper products, soda cans and glass bottles from trash being thrown out of vehicles. “I walk slowly, but I never walk backward” This is a quote from the 16th President of the United States of America, Abraham Lincoln. This quote still holds true today. Every step and action we take must be done cautiously and with much thought. Recently I received an email containing a link to a short documentary about the drug and alcohol epidemic in our country. It can be viewed at foxnews.com/politics/2018/03/02/kentucky-pushes-first-in-nation-opioid-tax.html. The Ugandan Kids Choir visited our community on September 19 presenting cultural music, dance and worship songs. The children were guests of the Hodgenville Christian Church Disciples of Christ and blessed all they met. A special thanks to all who attended and to those who welcomed and fed them. Thanks to the City of Hodgenville, ABE 97.3, The LaRue County Herald News, Awesome Cafe, Pizza Hut and Lee’s Chicken. The Choir will continue their annual tour of the U.S. and return this fall to Uganda, Africa.